Robinhood is giving listeners a free stock at http://morningshow.robinhood.com Cut your wireless bill to 15 bucks a month and get free shipping on your Mint Mobile plan at http://mintmobile.com/morning Greg and Tim react to Google's reveal of the Google Stadia. Robinhood is giving listeners a free stock at http://greggy.robinhood.com Fran, Andy, and Tim give their thoughts on Kingdom Hearts 3, Apex Legends, Division 2, Rage 2, and more! The first 500 people to sign up will receive a 2 month free trial. Go to https://skl.sh/kindafunnygamesdaily to start your trial now. We give our thoughts on Onimusha, Resident Evil 2 One Shot, Hades, and predict where we think gaming will be in 2021. Get a trial month of Hims for $5 at http://forhims.com/gamescast Fran, Jared, and Greg run though a whole mess of games they've been playing -- Tetris Effect, Just Cause 4, Overkill's The Walking Dead, Fortnite, Red Dead Redemption 2, and more! Get your first 3 meals free at http://blueapron.com/gamescast Get 15% off today at http://mvmt.com/kinda Tim and Greg talk about Assassin's Creed Odyssey, Transference, Life is Strange, Fortnite, and more! (Released first to http://www.Patreon.com/KindaFunnyGames Supporters on 09.28.18) Thanks for the support! Get 15% off today at http://mvmt.com/kinda We discuss Firewall, Dragon Quest 11, Valkyrie Chronicles 4, and Greg gives his Superman game pitch. (Released first to http://www.Patreon.com/KindaFunnyGames Supporters on 08.31.18) 00:05:52 - Jared's Hype 00:28:13 - Dragon Quest 11 00:36:35 - Valkyria Chronicles 4 00:50:16 - Firewall 00:57:58 - Superman Story Pitch 01:46:57 - Mobile Gameor Pepperidge Farm Cookie? Fank Cifaldi and Mike Mika of the Video Game History Foundation visit Gamescast to talk about their work preserving the raresr and most precious relics of gaming's golden age. Find out how you can do your party and become a part of history! 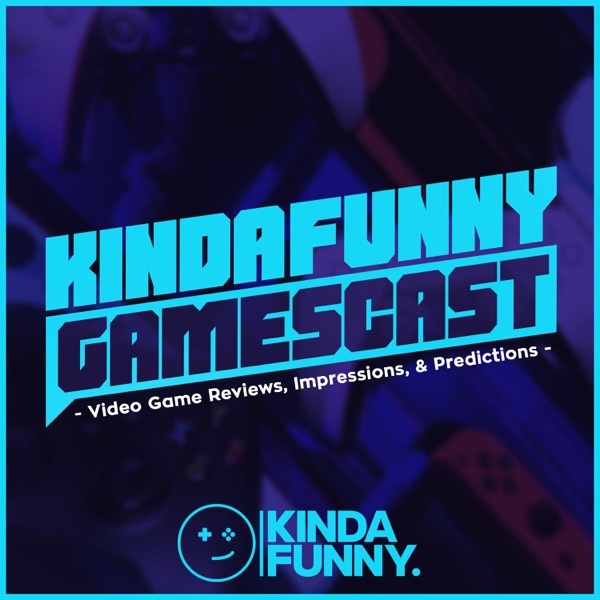 (Released first to http://www.Patreon.com/KindaFunnyGames Supporters on 08.17.18) Get a trial month of Hims for $5 at http://forhims.com/gamescast. Get your first 3 meals free at http://bluearpon.com/gamescast Special guest game director Mark Norris joins us to discuss how to make a new IP in 2018. All the biggest Ubisoft news of E3 2018! Beyond Good And Evil 2, Assassin's Creed Odyssey, Star Fox in Starlink, and more! All the biggest Square Enix news of E3 2018! Kingdom Hearts 3, Tomb Raider, Final Fantasy, and more! All the biggest Bethesda news of E3 2018! Fallout 76, Elder Scrolls 6, Doom 2, Starfield and more! All the biggest Microsoft news of E3 2018! Halo 6, Gears of War 5, Devil May Cry 5, and more! All the biggest Electronic Arts news of E3 2018! Anthem, Unravel 2, Star Wars, and more! God of War PS4 Director Cory Barlog joins Kinda Funny to talk about every story twist, massive boss fight, and more! Greg Sits down with Andy Serkis and talks about , Planet of the Apes: Last Frontier, Movies and Nick Scarpino! Funhaus' Elyse Willems joins us to discuss Golf Story, Nintendo Switch, her time at GameTrailers, and more! Anthony Gallegos joins us to dicuss what we think is the game of the year so far. (Released first to Patreon Supporters on 07.14.17) Thanks for all your support! We decide our E3 2017 Game of the Show and from Metal Gear Survive to Assassin's Creed to Mario + Rabbids we talk about all of the games we played on our last day of E3. From Destiny 2 to Detroit Become Human to Knack 2, we talk about all the games we played on our first day at E3 2017! All the biggest Nintendo news of E3 2017! Metroid Prime 4, Pokemon, and Super Mario Odyssey! All the biggest PlayStation news of E3 2017! Shadow of the Colossus, Spider-Man, God of War, and Uncharted! All the biggest Ubisoft news of E3 2017! Beyond Good and Evil 2, Assassin's Creed Origins, Skull and Bones, and Mario + Rabbids Kingdom Battle! All the biggest Bethesda news of E3 2017! Wolfenstein 2, The Evil Within 2, and Dishorned DLC! All the biggest Microsoft news of E3 2017! The Xbox ONe X gets release information, Assassin's Creed Origins, Crackdown 3, and Bioware's Anthem! We talk about Watch Dogs 2, Call of Duty: Infinite Warfare, the NES Classic, the 10th anniversary of the PS3, and our first consoles. The boys discuss the games they can't wait to play this year and the stuff that has them rock hard for next year. We talk about the rumors surrounding PlayStation Neo and NX and Tim gives his review of Star Fox Zero. Life Is Strange Co-Director Michel Koch comes to Kinda Funny to talk about the ending, Chloe, and your questions! Only watch/listen if you've beaten the game! Kristine Steimer joins Greg and Nick to talk about video game DLC, endings, worlds, and industry evolution. The crew reveal their top 5 favorite games of all-time! Horizon: Zero Dawn is our first ever Kinda Funny Game of the Show of E3 2015! All the biggest Nintendo news of E3 2015! Super Mario Maker! Star Fox! Zelda! Animal Crossing! All the biggest PlayStation news of E3 2015! Final Fantasy VII Remake, Shenmue 3, Uncharted 4! All the biggest Ubisoft news of E3 2015! South Park! The Division! Assassin's creed! All the biggest Electronic Arts news of E3 2015! Star Wars Battlefront, Mirror's Edge, Mass Effect! All the biggest Xbox news of E3 2015! Gears 4, Halo 5, Tomb Raider, Minecraft! All the biggest Bethesda news of E3 2015! Fallout 4, Dishonored 2, Doom, Elder Scrolls Online, Elder Scrolls Legends! Greg and GameSpot's Peter Brown played Metal Gear Solid V: The Phantom Pain for two days. This is how they feel about it. What does Zelda Wii U have to do to win over Colin and Greg? A reader asks, we debate, and then, talk about if The Division is set to be the next Destiny. Koji Igarashi defined the Castlevania series. Now, he's launching a Kickstarter for Bloodstained: Ritual of the Night, and he came to Kinda Funny to tell us all about the spiritual successor. Chie herself -- Erin Fitzgerald -- stops by for a special podcast that covers everything from Persona 5 to meditation to the portrayal of women in Japanese games.